The town of Journey's End may not literally be at the end of the world, but it sure feels like it to Nolie Stanhope. 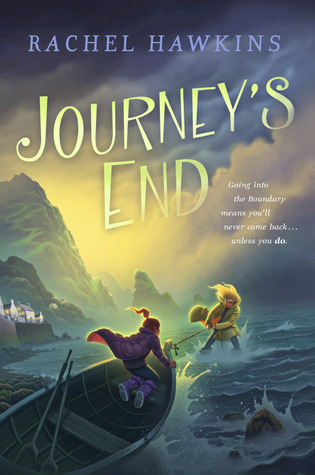 Spending the summer with her scientist father in the tiny Scottish village isn't exactly Nolie's idea of a good time, but she soon finds a friend: native Journey's Ender Bel McKissick. While Nolie's father came to Journey's End to study the Boundary--a mysterious fog bank offshore--Bel's family can’t afford to consider it a threat. The McKissick’s livelihood depends on the tourists drawn by legends of a curse. Still, whether you believe in magic or science, going into the Boundary means you'll never come back. …Unless you do. Albert Etheridge, a boy who disappeared into the Boundary in 1914, suddenly returns--without having aged a day and with no memory of the past hundred years. Then the Boundary starts creeping closer to the town, threatening to consume everyone within. While Nolie's father wants to have the village evacuated, Bel's parents lead the charge to stay in Journey's End. Meanwhile, Albert and the girls look for ways to stop the encroaching boundary, coming across an ancient Scottish spell that requires magic, a quest, and a sacrifice. "Albert Macleish woke up early on the morning he disappeared. It had to be early is he was to leave without his mum and da noticing, so it was still murky and dim when he opened the front gate and slipped out into the quiet, rutted lane that ran past his house..."
I'm just in love with this cover! Spooky Scotland seems to be all the rage this year, Earlier this year, I reviewed Janet Fox's THE CHARMED CHILDREN OF ROOKSKILL CASTLE, and if you liked that I believe you will like Rachel Hawkin's JOURNEY'S END also. The friendships are strong, the fog is scary, and who doesn't feel the hairs on the back of their necks prickle when you hear the words "ancient Scottish spell that requires magic, a quest, and a sacrifice"? 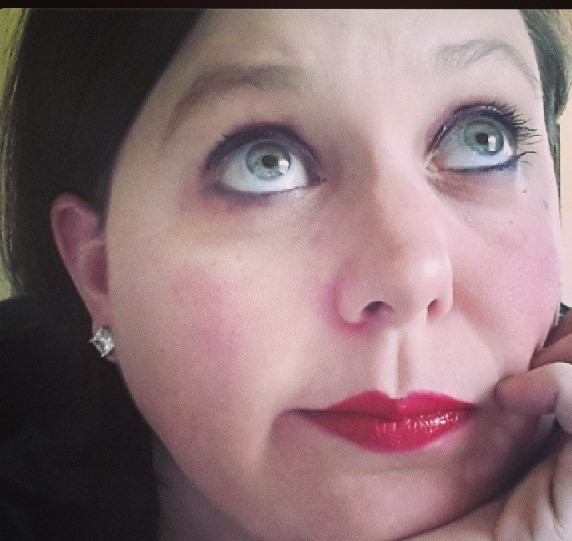 Rachel Hawkins is the author of the Hex Hall series. She lives in Alabama. My youngest son is a basketball fiend, and last year (when he was in 3rd grade) he found this series in his school library. We've spent many an evening reading through the series. If you have a sports-loving kid, be sure to check these out! 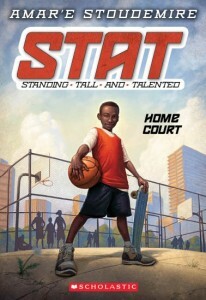 Based on NBA-star Amar'e Stoudamire's life, these books trace the success of young Amar'e (a.k.a STAT, the name given him by his father, and which is an abbreviation of "Standing Tall and Talented") on his middle school basketball team. STAT has two close friends, Deuce and Mike, who also love to play basketball--but Amar'e's talent takes him to another level, causing a rift. However, by the third book, the friends realize Amar'e's talent really is something else, and become his biggest supporters as he joins the school team and has to deal with some hostile 8th-graders. There are five books in the series now. The first on e was published by Scholastic in 2012. Amar'e Stoudamire actually writes very well, and the books are well-structured and enjoyable. Other subjects dealt with include divorce (Amar'e's parents live in separate states,) and balancing school work with sport. Born and raised in Lake Wales, Florida, Amar'e Stoudamire was a stand-out high school player, who went straight from high school to the NBA when he was drafted by the Phoenix Suns in 2002. During his career, he played for the New York Knicks, the Dallas Mavericks, and the Miami Heat. He currently plays for Hapoel Jerusalem. 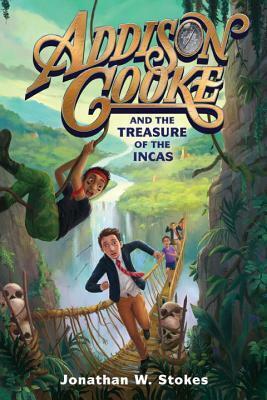 Smooth-talking, refined twelve-year-old Addison Cooke loves a grand adventure, especially one that involves using his vast knowledge of history and archaeology, learned from his aunt and uncle, both world-famous researchers. If that adventure includes an expertly-knotted Windsor tie and an Arnold Palmer on the rocks, all the better. Luckily for Addison, adventure has a way of finding the Cookes. After Addison's uncle unearths the first ancient Incan clue needed to find a vast trove of lost treasure, he is kidnapped by members of a shadowy organization intent on stealing the riches. An expert in Incan history, Addison's uncle is the bandits' key to deciphering the ancient clues and looting the treasure. . . unless Addison and his friends can outsmart the kidnappers and decipher the clues first. So it's off to Peru (business class, no less), across the Amazon, and all the way to Machu Picchu in a race for riches and history. Addison Cooke sat cross-legged in the school library, engrossed in an Incan history book. Under the spell of a decent read, Addison could forget meals, forget sleep, and even forget to go to class." This is a helter-skelter ride of a novel, with chase after chase. (I keep thinking, as I was reading, what a great movie it would be.) There are evil archaeologists complete with a gang of Russian henchmen; Ecuadorian gangsters; and caimans--South American alligators--just dying to take a bite out of you. There are spills and scrapes aplenty, and the '86-ers' (named after the street they live on in New York City) are up to the challenge. Jonathan Stokes does a great job of bringing his kid characters to life, giving each of them recognizable quirks. Addison comes across as a bit of an English gentleman from bygone days, and is quick on his feet. Molly, his sister, is a speedy sportswoman. Eddie is a bit nervous, but is invaluable for his Spanish skills, and Raj is a highly decorated Boy Scout and survival camp veteran with a brown belt in karate. Join William, an oblate on a mission from his monastery; Jacob, a Jewish boy who has fled his burning village; and Jeanne, a peasant girl who hides her prophetic visions. They are accompanied by Jeanne's loyal greyhound, Gwenforte . . . recently brought back from the dead. 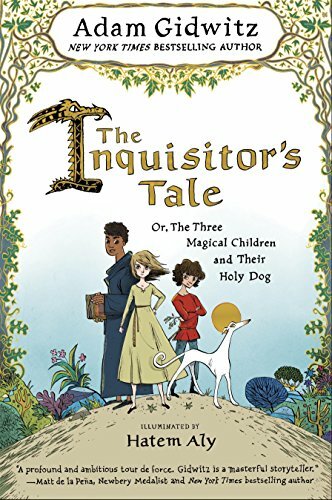 In a style reminiscent of The Canterbury Tales, our narrator collects their stories and the saga of these three unlikely allies begins to come together. This is clever, fun, philosophical and highly entertaining. 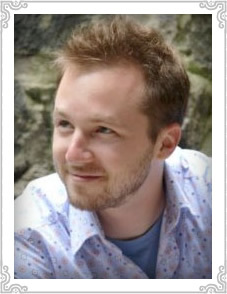 Adam Gidwitz (who wrote the highly popular Grimm trilogy) is steeped in medieval French lore, and there are surprises aplenty. The supernatural is not considered outlandish--there are indeed canine resurrections, farting dragons, a character who can foresee the future through visions akin to epilepsy, and an archangel. I loved all three of the children, a motley crew who band together to come to the rescue of each other--and whose goal is to prevent the mass burning of Talmud books in Paris. There's also a magnificent chase across the causeway to Mont-Saint-Michel. This would be a great classroom read-aloud for 5th grade and up. I was fortunate to be able to ask Adam some questions about medieval France. He replied in the form of a fun quiz. ANSWER: Inquisitors acted as detectives for the church, finding people who believed in God incorrectly and punishing them. Some wrote the stories of their investigations down. So, all of them. ANSWER When it got cold at night, the cows would often sleep in the peasants’ homes, and sometimes curled up in their beds of straw next to them! So yes, peasants slept with their cows. When it was cold and rainy during the day, they would often leave the cows in the church—because Mass was only on Sundays, and it was a nice, sturdy building. But at night, they wanted the cow’s body heat. Like the biggest, smelliest space-heater ever invented. QUESTION THE THIRD: The monastery of Mont-Saint-Michel had some serious natural defenses, which was good, because the monks who lived there were regularly attacked by Vikings, Normans, Bretons, and just about anyone with an army. Which of these defenses did it have? ANSWER: All of the above!!! It is built on cliffs, surrounded by quicksand, and when the tide comes in, it becomes an island! This is absolutely true. I have walked in the bay, when the tide was out, and our expert guide took us to a bed of quicksand and taught us how to sink into it—and how to get out. WARNING: if you visit Mont Saint Michel, ONLY walk in the bay if you have an expert guide who does this every day of his or her life. Otherwise you may indeed drown and die. Consider yourself warned. ANSWER: Most Jewish children learned to read, which was otherwise very rare in the Middle Ages. Even girls often learned to read. Jewish rabbis often studied with Christian monks, comparing translations of the Bible and teaching each other new methods of scholarship. Jews were severely constrained, though, in how they were allowed to earn money. They couldn’t join the guilds, almost none of them owned land, and so they were forced into either rag-picking, trading, or money-lending. And in 1242, twenty-thousand volumes of Talmud were burned in the center of Paris. ANSWER: If the lord was really fancy, he might have had an outhouse. But probably, you just would have gone in the corner. ANSWER: It was the farts. Really. All of this, and much more, appears in The Inquisitor’s Tale. Check it out!